… and we ate it. For a second I could almost imagine I was a real missionary. 24 hours later and we’re all still alive. Actually if you can let go of the mental image of it cooking in the pot, the meat is really OK, slightly darker than chicken, maybe a bit like a wild duck or something. 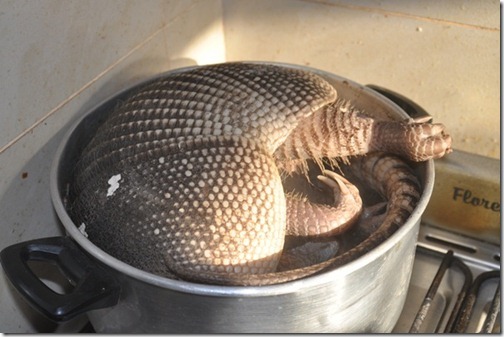 Apparently armadillos eat carrion and they like to hang out in cemeteries, so you might also like to work on forgetting that you might be eating someone else’s grandmother. 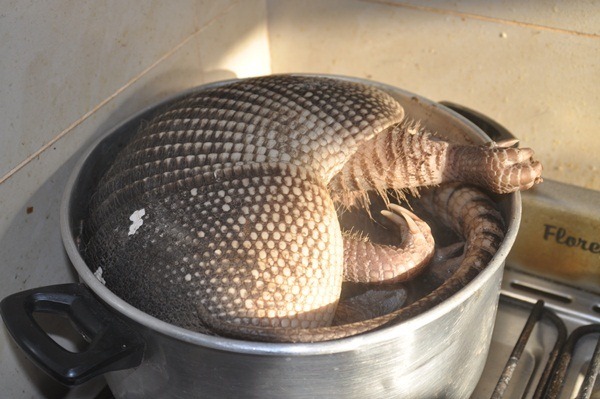 Maybe it’s the influence of the armadillo or something, but my kid has some really unusual tastes in food for a kid… I asked Joni what he’d like for lunch: “Fish pie, and can it have cabbage in it”. Personally I’m more than happy with fish pie, and I have no problem stuffing it with as many vegetables as he’d like, but aren’t normal kids supposed to demand hamburgers and chicken nuggets? Ten patients interned in the IPad were transferred on Thursday afternoon to the new hospital “Florencia Diaz”, in the neighbourhood of Jose Ignacio Diaz. This was the first measure taken by the new provincial Mental Health team, following renewed publicity regarding the deterioration of the IPad and other institutions attending those with mental health pathologies. Further investigation reveals that the IPad in question is an acronym for the “Instituto Provincial de Alcoholismo y Drogadicciones”. For once I’m not sure Apple would fully appreciate the publicity, but it made me giggle in a childish sort of way. I was going to say that Easter this year left me cold. But actually it didn’t even do that. So then I was going to say that Easter this year passed me by completely. But that’s not true either. Of course I noticed it. The special school did the stations of the cross. At Scouts we organised Easter activities and told the Easter story. It even had a mention in church this morning. We received Easter greetings in two languages by email and text from friends and colleagues. No, the thing that Easter didn’t do this year was have any impact on my emotional register in any way shape or form. Yes it was all very nice, but did it have any meaning? Not in the slightest. So here’s the question… If we’re supposed to be “overseas mission partners” (whatever one of those is) or “full-time Christian workers” (ditto) and the earth-shattering (literally) crux of the history of the cosmos and everything I believe isn’t capable of moving me to anything, is it time to find a new day job? I am encouraged in a strange sort of way by some newly retired friends who wrote saying how amazing it was finally to have time to reflect properly on the Easter story after forty years in ministry in which household Holy week conversations have mostly consisted of “what time’s supper today?”. Maybe that’s the sacrifice we’re called to make; by ministering to others we give up the privilege of experiencing it for ourselves. Or maybe it’s time to find a new day-job. I am also encouraged in an even stranger sort of way by a friend who has recently moved to San Francisco. She is attending what is probably the most solid Bible-teaching church in town, and yet, she says “In San Francisco I feel poor and black, even in the church”. The fact is that even the best local expression of church is a travesty, a pale imitation of the true body of Christ that we are supposed to be modelling. The prejudices and petty jealousies of the world are at least as evident within as without. Why am I encouraged by this? Because it reminds me that in the big history of the world, we were still on Easter Saturday. Yes Christ has won the victory, but most of the time we do not experience it. The very best of our best today is a mere shadow of what is yet to come. We are still waiting for Easter Sunday. So praise the Lord.